*Note to myself, never promise something unless I’m really good at predicting the future. So today, I’m running a little late, because Comcast thought would be a good idea to leave us in the dark for a couple of hours, you know, who actually needs internet at 6 am? So here I’m, after one big cup of coffee talking about flour and how to accurately measure flour. Flour is the most ingredient in bread, and the type of flour you use will determine how good or bad your bread is going to turn out. Wheat flour (the flours I’ll be talking about) is composed of protein forming components called gluten. Gluten is made of two types of protein : glutenin, which gives elasticity and gliadin which adds resistance to stretching. These two components, in contact with water or any other liquid, work together in balance to create structure within the dough, which in the end leads to that beautiful loaf of bread. There are 4 types of wheat flour that are most used in bread recipes. : all-purpose flour, bread flour, whole wheat flour and white whole wheat flour. All purpose flour is, I think, one of the most used flour in bread recipes. It has a gluten content between 9-11%. 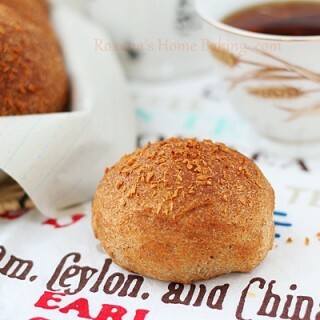 It’s usually made of a combination of hard and soft wheat and come in two varieties. Bleached and unbleached. Unbleached flour is aged naturally to oxidize the proteins and bleach out the natural yellow pigment present in freshly milled flour. Unbleached flour has more nutrients. 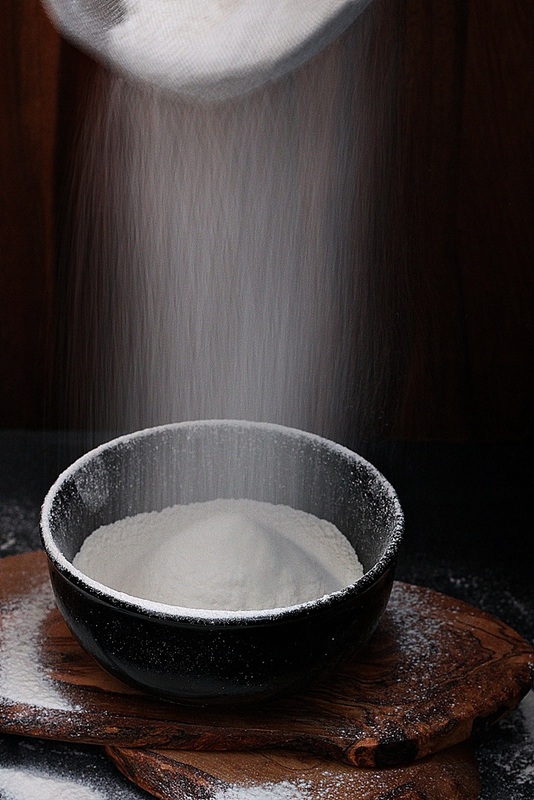 Bleached flour is aged quickly with chlorine dioxide gas. Bleaching also removes some chemicals that interfere with gluten development. If you look carefully, you’ll noticed that some bleached flour are enriched, that means after the bleaching process some nutrients (mostly iron, B vitamins and sometimes calcium) are added back to the flour to match the nutritious value of the unbleached flour. Both flours can be used in bread recipes with no problems. I haven’t noticed a difference when baking with bleached or unbleached, so don’t sweat over it. If you’d like to hear my two cents, than use unbleached flour for bread recipes and bleached for cakes, cookies and other pastries. As the name stats, this type of flour is used for making the cream of the breads. 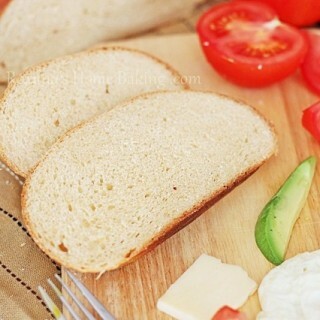 Unbleached bread flour is made from hard red spring wheat that is aged without chemicals or preservatives. (thus the higher price). Some national flour brands offer bread flour at a lower price, flour that was aged faster and enriched when the process was done. The high percentage of gluten, usually between 11-14% , makes the dough more elastic and easier to work with creating light-textured breads. Bread flour can be substituted with all-purpose flour, but you have to keep in mind that bread flour, since it has a higher gluten content, requires more liquid. 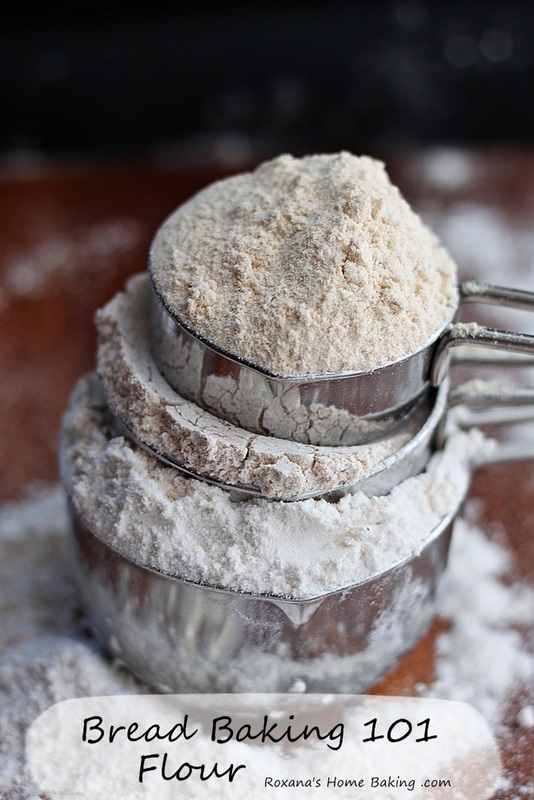 When using all-purpose flour you can either add more flour (usually 1 tbsp per 1 cup flour) or add less water. Whole wheat flour is made from the whole wheat berry, including the oil-rich bran and germ. You should check the label to see if it’s 100% whole wheat flour, that means nothing was added or taken away. The flour is as natural as possible straight from the mill. Whole wheat flour creates intensely nutty flavors and a variety of fine to coarse textures that bake up into chewy crusted breads. Whole wheat flour has the highest gluten percentage, sometimes up to 16%. You may be wondering now, than why the whole wheat bread are not the fluffiest of all, in fact they are heavy and dense, especially 100% whole wheat bread. That’s a good question, and I do have the answer for you : since the whole wheat flour is not as finely ground as the bread or all-purpose flour the hulls contained in the whole wheat flour tent to damage the gluten strands, making it less effective. White whole wheat flour is made from a new type of white spring wheat that is light-colored and sweet. It’s gluten percentage it’s around 12% making this type of flour a good substitute to all-purpose flour with no loss of light texture. It is as nutrition as the whole wheat flour but with a milder taste. I’m not going to talk about that brands are the best and which ones are so and so. My advice is to buy different brands, try them and see how you like them. I live in the somehow northern part of the country where King Arthur Flour (my go-to flour for bread) is available everywhere, but I know when I visit my mother in law in the south I hardly find it. Of course there are national brands like Pillsbury and Gold Medal that do a wonderful job as well, all you have to do is find your favorite. Measuring correctly the dry ingredients makes a world difference when baking (and not just bread). You can either add too much (in most cases) or add too little resulting in not at all satisfying results. My favorite way to measure flour is weighting it. There’s nothing more accurate than measuring your flour with a digital scale, may it be in ounces or grams. 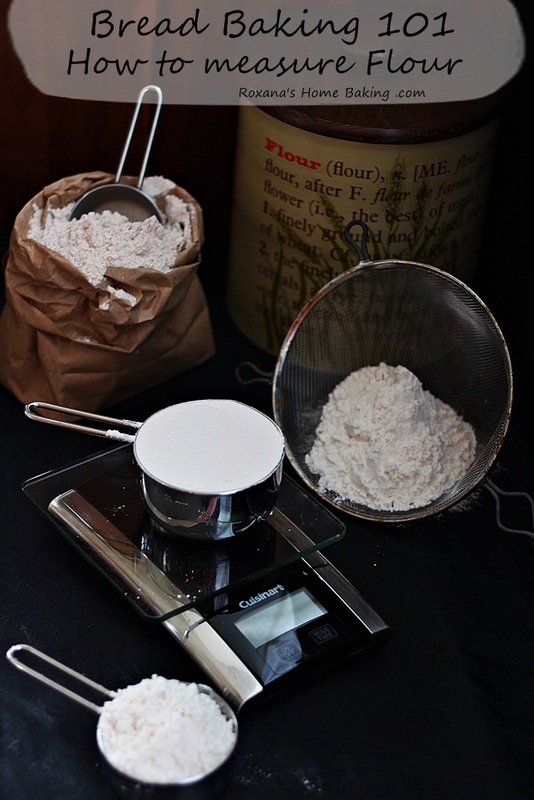 If you still not have a digital scale (you really should buy one, it’s not at all expensive and it will save you lots of headaches in the long run) I advice you to fluff the flour in the bag or container and then gently spoon it in a measuring cup. With an offset spatula, remove the excess. A cup of flour should weight 120 grams or 4.25 ounces. Roxana, I'm loving these basics series. 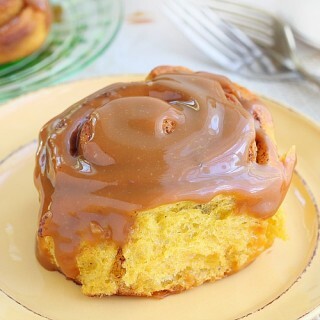 It's nice to see a refresher post on basic baking knowledge. Very useful information, coupled with beautiful photography! You should start your own e-book! Just saying...hehehe. I said it before, but I'll say it again...such a great, informative series, Roxana!!! Great post! Love all your breads, so amazing! I just made bread yesterday, and was thinking of you! amazing post! I am in love with your photos, and very well written! 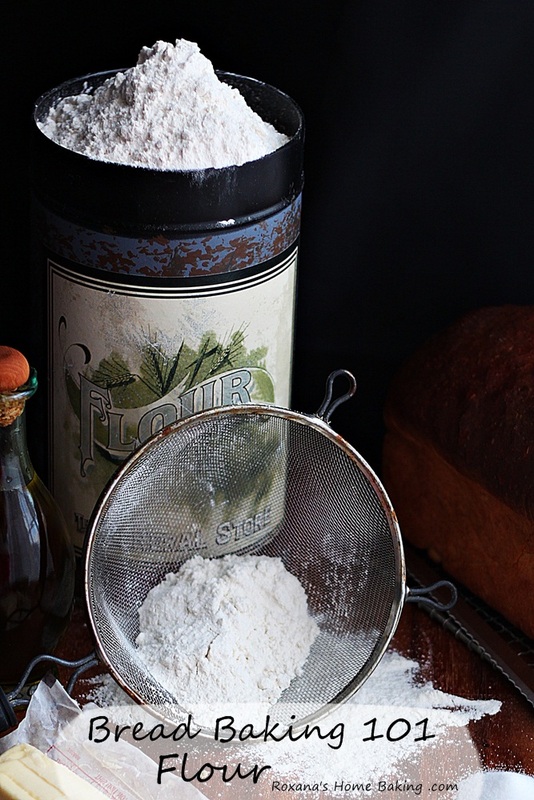 Love your photos, and the info on the different types of flours is such a great resource! This is just such a great post and your pictures are phenomenal! Great tips! I need to start weighing! I have received better results when I fluff and scoop my flour. I have weighed both the scoop and spoon method...and the scoop wins each time! oh...and thank you for such an informative post! Great post Roxanna, very informative! Sorry about your internet, that stinks! Wonderful!!!! I learned so much! :) Thank you! First of all, your images! Wow, Roxana. The first shot with the stacked flour and the shot with the sifting - beautiful. And I am loving this series, so helpful, especially for me - I love to bake bread but need to learn more! oh girl this post has been getting pinned left and right! Good for you! It is amazing and I shall take your wonderful information and use it towards my GF baking now! Thank you for these very informative posts! As a newbie bread baker this series is extremely helpful! Hi I am glad I found your site and the informative information you are providing is awesome...I am trying to make a family bread/hot roll/cinnamon roll recipe that is famous by my late aunt...I only got to work with her a few times but I love making this recipe and rolling around a home bakery business possibly ...Thanks for this site and I look forward to more!!! p.s. do you bake any organic breads or any advice on that? Thank you for this information.Hopefully after trying 3x,my homemade bread for my group of friends will turn out good,I just bought bread flour.My bread doesn't raise too well,as I remember my mothers bread many years ago,hers was perfect. Very interesting to read how to measure flour accurately. But, seriously, why not just weigh it? My kitchen scales cost £9 and I use them for accuracy every day. Hi Sarah, I often say my kitchen scale is the most important kitchen tool I have. I weigh everything!